Great burgers at Chef Burger - just one block away! Apartment nestled right between Dann Carlton and Intercontinental hotel. Apartment located in second building on the right side. Friday sunset beers on Cali's river boulevard - 3 blocks away! One of Cali's best sushi restaurants - just 2 blocks away! La Diva italian restaurant with wood-fired oven. In the middle of El Peñon, close to amazing restaurants and upscale nightlife, lies this freshly remodeled 3-bedroom / 3-bathroom apartment. All bedrooms come with A/C, TVs and all of them have direct access to a bathroom. The spacious and comfortable living room integrates with the dining room, open kitchen with the bar and ample balcony. The kitchen is fully equipped and the apartment comes with a washer and dryer at your full disposal. Wi-Fi is 10MB and there is one parking lot in the garage available for clients. Smoking is not allowed inside the apartment, but you can smoke on the balcony with the door closed. Guests have full access to all the facilities of the apartment. It is your home away from home. One important thing to note is that the apartment is on the 3rd floor, and there is no elevator, but it’s an easy climb for any able bodied person, but if you have difficulty with stairs it may not be the best choice. 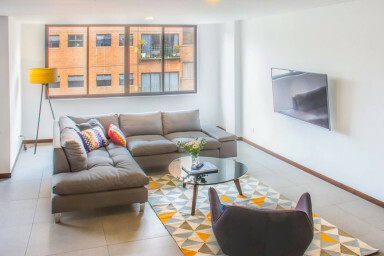 Myself or my co-host Libardo are available 24/7 for any inquiries or questions you might have and the apartment contains a comprehensive guidebook with information of the details about the apartment. The building has one parking spot in the basement. El Peñon is a Zona Rosa and Cali's premium hotel district. Within walking distance, you will find more than 40 restaurants, fancy cocktail bars, bakeries, home-made ice cream shops, supermarkets, pharmacies, public transportation, Cali's river boulevard, the historic center, colonial San Antonio, the Tertulia Museum, etc. In other words, this is the place to be in Cali.